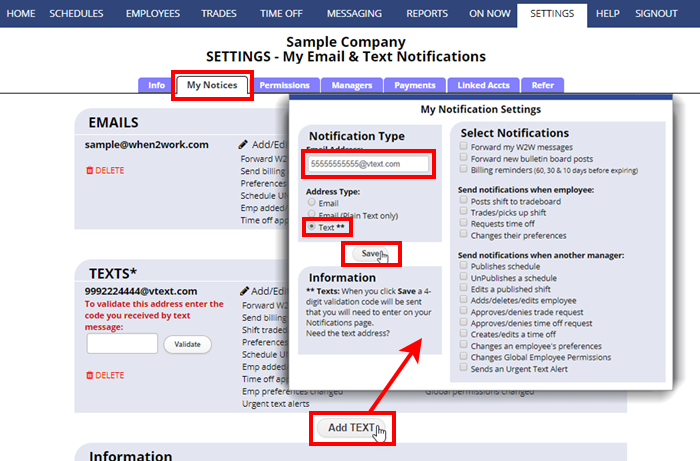 If a user can receive text messages, they can sign in at WhenToWork.com and set up when to be notified by text message. To set up your own text notifications, you need to know your “text message address” which is usually the cell phone digits @ the cell carrier’s domain address. The best way to know your address is to send a text from your phone to your email and then note the “from” address. Once the text message address has been added, a special validation code is sent to that address that must then be entered into our system to verify the address is correct. Managers can set their own notices and choose from the following notifications on the SETTINGS>My Notifications page. Managers can enter their text message validation code on their SETTINGS>My Notification page. We do not charge to send, but the recipient may be charged to receive text messages – note that some of the notification options could generate a lot of text messages – so choose carefully and be sure to check the carrier’s charges and limitations before setting up. It is always best to have each user set up their own text message notifications. Wireless Service Providers – below is a list of likely email addresses for common carriers. Where the address says “number,” use the digits of your cell phone number. Please contact your cell phone service provider to find out your text message email address if you have trouble. Orange@orange.net. You will need to create a user account at orange.net first. PCS Rogers number@pcs.rogers.com. Requires prior registration with PCS Rogers. Verizon Wireless (formerly Airtouch) number@airtouchpaging.com. This is ONLY for former AirTouch customers. Verizon Wireless customers should use Verizon Wireless instead.